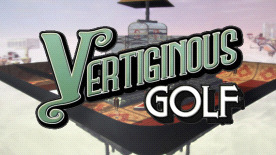 Vertiginous Golf is a physics based first person exploratory mini golf game set in a steampunk alternative universe. You travel from a Victorian world of eternal rain to a sun-drenched realm high above the clouds known as the Vertiginousphere, where a game of equally challenging and relaxing mini-golf awaits you. Vertiginous Golf elevates mini golf to a more mature level than the typical casual and child-orientated mini golf games currently available. The players navigation tools include a putter, chipping wedge, a set of cameras placed at strategic positions on the holes and a fully controllable first person mechanical humming bird that is used to help plan the player's route through the holes. As an aid to aiming there is a rewind mechanism enabling the player to instantly undo or rewind a shot they're not happy with without losing a stroke. This comes at the cost of a losing a proportion of their "rewind power" based on the distance the ball has travelled, so the longer the player takes to decide to rewind the more "rewind power" they will use up. This power is recharged slowly when the player uses the putter, but not when using the pitching wedge, to encourage more use of the putter. Another feature of the game is a long glowing trail the ball leaves behind, part aiming tool and part shot evaluation tool that helps navigation while leaving semi-permanent visual feedback as to the player's performance. The holes are designed with a plethora of moving obstacles including: travelators, pipes, mini helicopters, platforms, spinners, blockers and bouncers along with a variety of contraptions that help and hinder the players progress through the holes.